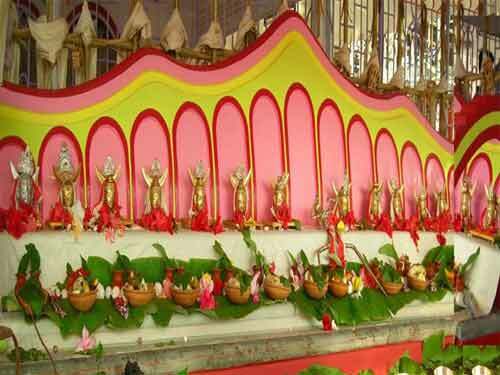 Kharchi Puja is observed at the Chaturdas Devata Temple at Old Agartala or Purana Haveli in Tripura. Kharchi Puja 2019 date is July 9. The highlight of the festival is the bathing ritual of 14 deities worshiped at the temple. The deities are originally tribal and were later adapted into the Hindu fold. All the deities have names in Kok-barok, the tribal language. It is observed on the Shukla Paksha Ashtami day in Ashad Month. The fourteen deities worshipped at the temple are Lord Shiva, Vishnu, Brahma, Durga, Lakshmi, Saraswathi, Kartikeya, Ganesha, Earth, Ganga, Agni, Kama, Himavan (lord of mountains) and Varuna (god of ocean). The popular and local names of the Fourteen Gods are Hara, Uma, Hari, Ma, Vani, Kumara, Ganapa, Bidhi, Kha, Abdi, Ganga, Sikhi, Kama and Himadri. Numerous stories about the worship of the fourteen deities can be found in the Rajmala - the archives of the kings of Tripura. Legend has it that King Dakshin sensing defeat in a battle with his elder brother King Drikpati, fled the battlefield taking fourteen heads of soldiers along with him. He established a new kingdom in central Cachhar along the banks of Barabakra River. Since then the descendents of King Dakshin have worshipped the fourteen heads as deities. Interestingly, eleven of the deities are brought out only during the Kharchi Puja. Rest of the year they remain behind closed doors. A unique feature is that only the heads of the idols are worshipped, an indication of the tribal influence. All the deities are made of bronze except that of Lord Shiva, which is made of silver. There is a half-moon symbol behind the head of the fourteen deities. The half-moon was the symbol of Tripura kings. The fourteen gods are taken in a ceremonial procession to a nearby river for a ritualistic bath and then offerings are made to them. A large fair, cultural programs, traditional dance and music are part of the festival. Traditional food of the region can be enjoyed during the period. Like in other tribal pujas large number of goats and pigeons are sacrificed to appease the deities. Ker Puja is observed 15-days after Kharchi Puja and it is another important ritual in Tripura. Chaturdas Devata Temple is around 8 km from Agartala, the capital of Tripura.